The Educational Corps (Or “Edu-Corps“) has a long and proud history of service as part of the historic Jedi Service Corps, serving as an avenue for those members of the Order who otherwise fail their training to continue to serve the galaxy at large through other means. Following the great pandemic that swept across the galaxy at the opening of the Imperium War, the Corps was disbanded with those few Jedi who remained being pressed into armed service. 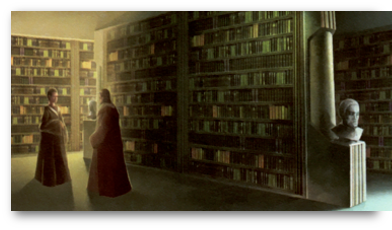 With the war over and the galaxy on the mend, Grandmaster Don’roq formally announced the re-establishment of the Educational Corp with new facilities at the ancient library complex on Obroa-Skai on 362.17ABY. Headed and coordinated by Jedi Master Qoui Axon on Ossus, the Educational Corp works to restore, rebuild and expand educational institutions across the galaxy.